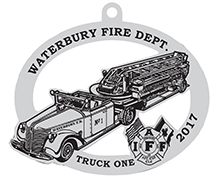 Help us improve the lives of Children from Connecticut and around the World who have survived life-altering burn injuries by purchasing the 12th Annual WFD Christmas Ornament. 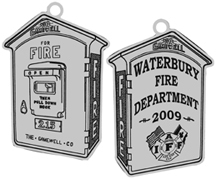 These Handcrafted Solid Pewter Ornaments will provide holiday enjoyment to your family for generations to come. 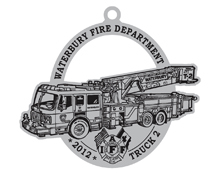 All Proceeds from the sale of these Ornaments benefit the Connecticut Children's Burn Camp. Order today as quantities are limited! It is tradition for fire companies or stations to create custom patches that represent their unique characteristics. These patches are a way for the fire service to promote company pride. Actual Size: 2 -1/2" x 2-1/2"
Actual Size: 2-1/2" x 2-1/2"
The “Queen Mary”, a 1939 American LaFrance 85’ tiller aerial ladder, was placed into service as Truck 1 on March 4th of that same year at Fire HQ. Its nickname came from its enormous length of 53 feet, which required an additional firefighter in the back to steer the trailer. It was run as a two-piece company. Ten firefighters were assigned to the unit with six riding the truck, two on the Emergency Wagon (Rescue), and two Chief’s aides as necessary. It responded to its first working fire on March 6, 1939 at Worth’s Store on 95 Bank Street and remained in service until 1969. Station 3 was built in 1903 at 288 Washington Avenue, in the Brooklyn section of Waterbury. It was constructed to replace a volunteer station located at 905 Bank Street and housed both Engine Company 3 and the Bureau of Auto Repair. In May 1964 the firehouse was shuttered to make way for the new Route 8. Upon the closing of Station 3, Engine 3 was reassigned to Station 4 on Baldwin Street and the Bureau of Auto Repair was moved to the new Street Department facility on Benedict Street. Engine 3 was disbanded on April 28, 1968. It is tradition for fire companies to create custom patches that represent the unique characteristics of their company. These patches are a way for the fire service to promote company pride. 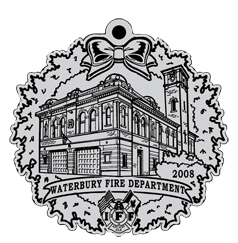 Every Waterbury Fire Department station has a patch of their own design. Engine Seven’s patch, designed in 1983 by members assigned to the unit, consists of two halves of a walnut surrounded by fire with dice in the center adding up to the number seven. The walnuts represent the station’s location at 315 Walnut Street. In 1992, Fire Chief Thomas Brennan recognized a need for a Heavy Rescue for Waterbury. Twenty firefighters were chosen for six weeks of extensive training in vehicle extrication, hazardous materials, technical rope rescue, high angle, water rescue, and forcible entry. When completed Rescue/Engine 9 was put into service with an apparatus borrowed from the City of Hartford. As inventories grew, a need for a modern rescue platform became evident. In 1995, a new custom designed Rescue was built. This apparatus served the city well for 15 years. 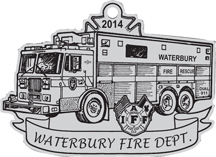 This latest major redesign of the Waterbury Fire Department patch was created and issued in 1991. Each color represents a different aspect of the Fire Department. The blue represents the firefighter’s uniform, red for fire. The gold represents brass, as Waterbury was known as the brass capitol of the world. 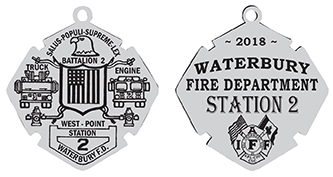 Established in 1900 and stationed at the Burton Street Firehouse, Truck 2 was Waterbury’s first paid Truck Company. Due to its location in the heart of the city’s north end, this company saw heavy fire activity. Truck 2 was relocated to the new Northside Fire Station on Jan 28, 1970. This model is a 2005 Mid-Mount Platform design built by American LaFrance. It is designed to keep overall travel height as low as possible. Truck 2 has an all-steel ladder with a working height of 93’, a 1,000 lb. capacity, and can flow 2,000 gpm of water. The overall length is 46’, height is 11’, and weight is 75,500 lbs. Truck 2 is only the second Tower ladder in the history of the Waterbury Fire Department. Station #5, originally named the Brass City Volunteer Fire Company #6, was founded in 1886 at 638 East Main Street. On February 14, 1928 it was disbanded and became Engine Co. #5. 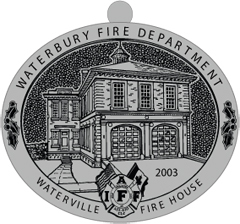 After becoming part of the paid Waterbury Fire Department, a new single-story bungalow station was built. In 1929, Station #5 received an American LaFrance Pumper, its first new apparatus. 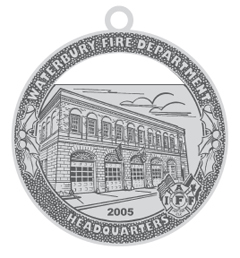 During the early 1990’s, firefighters refurbished the station through the generosity of the East Enders Community Club which donated funds to serve the East End of Waterbury. In 1803, the first post type hydrant with valve in the US was invented by Frederick Groff, Chief Engineer of the Philadelphia Water Works. These hydrants were connected to a wooden water main. The City of Waterbury constructed four reservoirs to supply the citizens with water in 1830. In 1890, Waterbury completed the 185 million gallon capacity Wigwam Reservoir in Litchfield County to meet the needs of the growing city. Due to the elevation of the reservoir, the system was naturally pressurized. At that time Waterbury had 294 hydrants. Today Waterbury has over 2,700 hydrants comprised of five different types; AP Smith, Ludlow, Darling, Holyoke, and the Metropolitan. These hydrants can flow up to 1,500 GPM, depending on their location in the water system. The Gamewell Fire Alarm System, designed by Dr. William Canning of Boston, was modeled after the human nervous system. After partnering with Moses Farmer of New Hampshire, the first Fire System sold in 1851 to Boston for $10,000. In 1859, John Gamewell purchased the patents at a cost of $30,000. Waterbury installed the Gamewell system Feb. 22, 1883 which consisted of 15 boxes at a total cost of $5,000. After pulling a box, the signal went to Fire Headquarters on Field Street. It was then transmitted to each firehouse where a man on watch determined which companies were in service and available to respond. Box #215 located on Sparks Street and North Main Street was well known in the 1950’s and 60’s, with 13 major fires within a nine year span. A standing order was to automatically lay a line when an alarm sounded from this box. In 1962, Waterbury replaced the antiquated Gamewell system with SNETs’ new fire alarm boxes containing a telephone. Before retiring the system, Waterbury had a total of 452 Gamewell boxes throughout the city. In 1896, construction began on this firehouse located at 97 Burton Street. This station was completed in 1900 at a cost of $14,208 and housed the first career members of the Waterbury Fire Department. These firefighters came from the ranks of “call men” from the former Volunteer Phoenix Hose Company. This first paid company of the Waterbury Fire Department designated as Engine Co. #1 consisted of a horse drawn steamer, a hose wagon, and a coal wagon. Also in 1900, Truck Co. #2 was established and housed at this firehouse. Years later, this station had the privilege of housing the city’s first motorized fire apparatus. On April 14, 1912 tragedy struck Burton Street when Fireman William T. Squires perished fighting a fire in the attic of the firehouse. This firehouse proudly served the citizens of Waterbury for 70 years. It was closed on January 28, 1970 and its companies were relocated to the newly constructed Northside Fire Station on 1979 North Main Street. Actual Size: 2-3/4" x 2-1/2"
In 1907, construction began on Station 4 at 823 Baldwin Street to house Waterbury Fire Department’s newly formed Engine Co. #4. Engine 4 replaced Rose Hill Vol. Co #5 in 1908. The first apparatus assigned to Station 4 was a 1908 horse drawn hose wagon. In 1915, Station 4 received its first motorized apparatus, a type 12 American LaFrance. During World War II, Station 4 also housed a civil defense unit. This unit served an important purpose as Waterbury’s brass production played a vital part to the war effort and was a potential target of attack. In 1962, Engine 3 was reassigned to Station 4 from the Brooklyn Section of Waterbury when their firehouse closed to make way for the new highway (Route 8). Engine 3 disbanded in the late sixties, returning Station 4 to a single company house. During its long dedicated service to Waterbury, Station 4 also housed the “Line Gang” whose responsibility was to maintain the Waterbury network of Gamewell Boxes. This was the primary means for citizens to report an alarm to the fire department for many years. 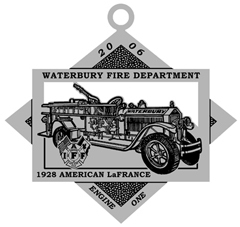 Fourth in the series, this ornament depicts WFD Engine One as it was delivered in 1928. Purchased by the Waterbury Fire Department for approximately $5,700 under Fire Chief H. Heitman, it was assigned to Engine 1 at the Burton Street firehouse on December 1, 1928 and tasked with protecting the citizens of the North End of the city. Engine 1 was a style 112 triple combination pumper meaning it carried hose, held water, and had a pump. Unusual at the time it was a right hand drive (the steering wheel was on the “passenger” side of the engine) and had a rotary style pump (required no priming). The pump was rated at 750 gpm. Rich with history, Engine 1 served the citizens of Waterbury with distinction. During the Great Flood of 1955, also known as Black Friday, this engine transported many victims from the Brooklyn section of the city to St. Mary’s Hospital. It then pumped for 3 days straight stopping only for refueling to rid the Anaconda Brass Company of water. It was also instrumental in more than 100 2nd and 3rd alarm fires. The modern day Engine 1 still protects the North End and is assigned to the “Northside” Firehouse on North Main Street. 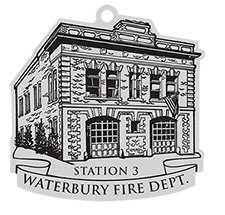 Actual Size: 2-3/4" x 3"
Actual Size: 2-1/4" x 2-1/4"
Third in the series, this ornament depicts the Waterbury Fire Department Headquarters. The original Waterbury Fire Department Headquarters was housed with the Police Department on Leavenworth Street next to Drescher's Restaurant. In 1913 this building was physically moved to Kendrick Avenue and occupied solely by the Fire Department. In 1916, the Fire Department moved Headquarters to its present location in the City Hall complex at the corner of Grand and Field Streets. This move was made after a devastating fire required City Hall to be rebuilt. It was originally constructed to house Mutual Hook & Ladder and Chemical Engine #1. Also, in the tradition of the fire service, brass slide poles were installed. At 26 feet in length, the four poles remain the tallest in Connecticut. In 1956 the building sustained minor damaged due to an explosion in the kitchen during routine maintenance, severely burning 2 firefighters. Over the years, Headquarters housed a Rescue Truck and Emergency Wagon, which later became the E-Car. Headquarters is currently home to Engine 10, Truck 1, the Fire Chief, Assistant Chief and Deputy Chief. 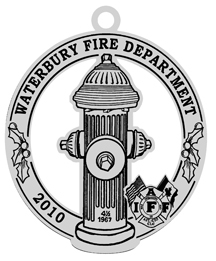 Second in the series, this ornament depicts the Police and Firefighters Memorial which stands in front of City Hall. 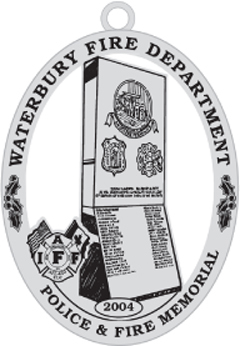 "Dedicated to the memory of Police and Firefighters of the City of Waterbury who have died in the line of duty." 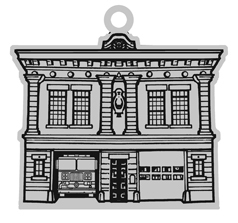 Actual Size: 3 " x 2"
Actual Size: 2-1/2" x 2-3/4"
First in the series, this ornament depicts the Waterville Firehouse located on Thomaston Avenue. The building was then leased to REMCO as a storage facility for their emergency equipment. In 2002, REMCO disbanded, leaving the firehouse empty once again. Although the building was in disrepair, the Waterbury Fire Fighters Association Local 1339 saw this as an opportunity to make an investment in their community, and purchased the property from the city. Without delay, the members began the painstaking process of restoring the historic building to its original grandeur. We thank you for helping us support the CT Children's Burn Camp!